Both the Conservatives and Labour have rejected petitions calling for a second EU referendum to be held. MPs held a debate at Westminster in response to four petitions on Parliament's e-petitions website. The largest one has attracted more than 130,000 signatures since September. Brexit minister Robin Walker said there would be no second referendum and Labour spokesman Paul Blomfield said he understood the "frustration" behind the petitions but ruled one out. The SNP's Peter Grant said he would not rule out another Brexit referendum at this stage but added that people had to "live by the results of their decisions". The largest petition calls for voters to be given a "final say" on the Brexit deal before the 2019 exit date. If no deal has been reached by the date of the referendum, the petition proposes the third option could be removed. Are e-petitions a waste of time? The petition was started by Tom Holder, from Southwark, London, who stood for the Liberal Democrats in Castle Point, Essex, in this year's general election. A similar petition last year attracted 4.1 million signatures. During the Westminster Hall debate, Lib Dem MPs, several Labour members and the Green Party's Caroline Lucas called for a referendum to be held on the final Brexit deal reached between the UK and the EU. "Second thoughts are always superior to first thoughts," argued Labour's Paul Flynn. 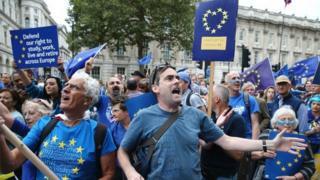 But their calls were dismissed by Conservative Martin Vickers, who said most people who had signed the petitions wanted to change the result of the first referendum. Rather than another referendum, Mr Blomfield said Labour was arguing for Parliament to have the final say. And rounding off the debate for the government, Mr Walker said a "clear majority" of people had backed Leave last year. "There will be no second referendum, our focus should be on making a success of Brexit," he added. Reality Check: Where next for Brexit talks? The government says Parliament will get a "meaningful vote" on the final agreement with the EU before it is concluded, which would give MPs the choice to accept the deal or leave the EU with no agreement. The Petitions Committee considers all petitions with more than 100,000 signatures for debate. Petition debates cannot change the law, and MPs do not vote on whether to implement the petition.